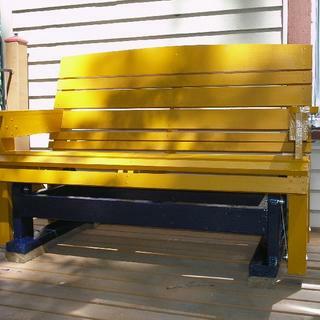 Turn virtually any bench into a glider. This unique hardware lets you turn virtually any bench into a glider! Measures 7-1/2" between centers with 1-1/4" offset. With rust-resistant plating and ball bearing pivot points. Mounts with common 1/4" dia. bolts (not included). Offset project legs and sub-base 1-1/4" on each side. Well made and perfect for my project. Made slider and my brackets out of wood...but too much friction so purchased this set and presto. Slight bending also needed to be done, but all in all, a successful installation and everything works great! IThe glider brackets hardware is JUSt what i needed!!! They worked real fine, I just wished I checked your site a long time ago. The only thing I you could do is reduced your mailing cost, other then that, I was satisfied . Your product was outstanding!! Saves a favorite porch glider! 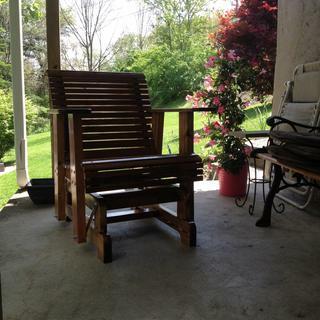 The items arrived timely, and were a perfect fit to replace worn-out glider arms on a favorite porch chair! Exactly what I needed. Perfect fit. These brackets have been quite and smooth, no problems. Replacement for old glider worked great , very well made , highly recommend them ! These glider brackets are sturdy and just what I needed to change my porch swing from a hanging chain type to the glider that I needed it to be. Simple and accurate instructions. glider brackets are high quality. instructions were great, however I had to bend each to fit aluminum glider. Otherwise you delivered on time and I couldn't be happier. Really like the glider hardware - glider was designed to use pivot hinges. I retrofitted the glider with the bracket hardware after the pivot hinges did not work. I highly recommend these brackets. I was very pleased with the parts I ordered and the speedy delivery. I chose this company over others based on the reviews I read. I will use them again without question. They work well. Much easier than making my own. 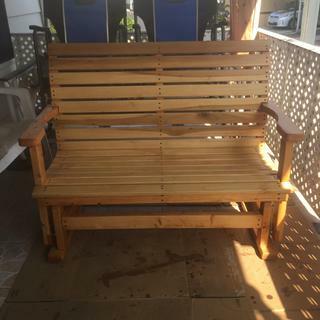 Glider for my front porch. This product was well made and fit was perfect. We received the product within 3 days. good value for the price. Easy to install and works great. Brackets were delivered promptly and arrived in good condition. 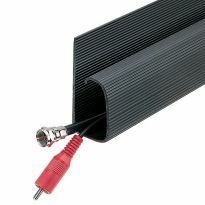 They performed as indicated and were easy to install. These glider brackets are excellent hardware devices! I have been using them for about three years on all my hand made Rocker/Glider assembly's. I have never had one fail or any of my customers complain!! I just completed my 4th glider and I like the hardware very much! The glider bracket worked great and my chair glides very smooth. The glider bracket hardware worked great! Fast shipment and worked great. Two swings working like new! 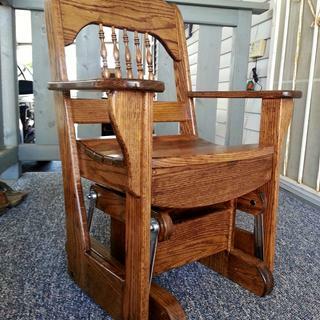 Hand made Glider Rocker for my granddaughter. 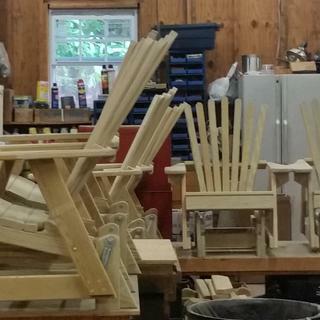 They are prefect for glider swings and chairs, highly recommend them for such projects. 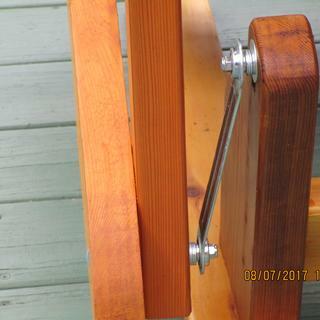 These glider brackets worked perfectly for not one but 2 cedar gliders we gave our daughters for Christmas. Brackets installed easily and worked fine, nice smooth motion. A quality part that adds value to my projects. The glider brackets are sturdy and smooth. Would buy them again if I built another glider. I also recommend them. I installed a set on a glider that sits in salt air and after 2 years it still works perfectly. 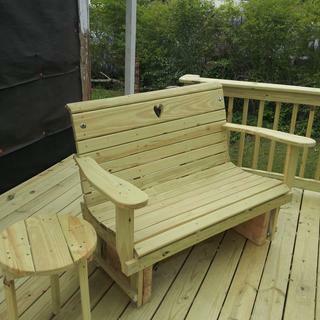 Other sets were incorporated into three more glider designs and were easy to install. Good product that I recommend. Great quality works smooth with no problems. This part is the perfect replacement for these ancient metal gliders on my patio. The originals are breaking one by one so I bought these and they fit great and are of excellent quality. Works exactly as represented. Added to a memorial bench. Perfect. These worked fine. I wish there had been an option for just the bearings so I could make my own swing arms. These glider brackets were a replacement for broken ones. It was a good swap out & the glider works well again! I used these glide bars on my first glider and they worked great. They were easy to adept to my plan which was based upon my comfortable proch swing hung by chains.The only problem was that the instruction said to hang them vertically. This made the glide back-and-forth motion to be too short only about 2 inches. I saw some other factory made gliders and home made ones and each one had the lower bolt pattern set in from the uppers by 2-3 inches. After I moved my bolts in by 2 inches then the glide motion was greatly improved and smooth like a swing.I will order again for the next project. 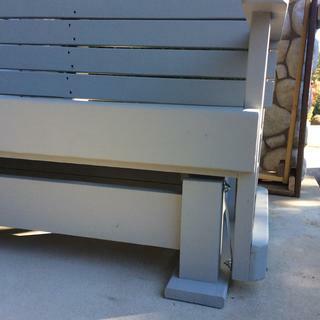 I have used the glider brackets on 6 different glider benches and chairs. They work just like they are suppose to. Very simple and easy to use, and glide great. The glider brackets work well, were easy to install, and appear to be very sturdy for the long haul. This is one of my biggest misunderstandings to date. 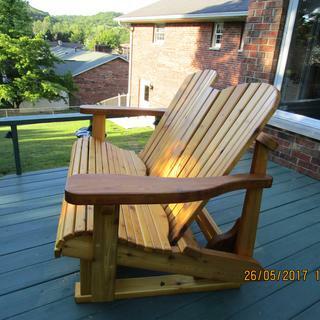 When our youngest son (18) said he wanted an oak glider swing, this was what I envisioned. As I was finsihing it he asked, &quot;isn't it going to sink into the ground?&quot;. What he actually wanted was a throw-together for next to the fire pit. What he got should provide him a lifetime of enjoyment. I also threw together a jumbo rocker from 2X4s for the fire pit. Product performed as expected. I used these to convert a stationary bench to a glider. Very good product. Helped me convert a hung swing to a glider. Thank you for supplying this set of brackets. I really enjoyed making this glider and the brackets worked out really well. The purchaser of this glider was so excited and she really loved it. I will definitely purchase more products from your site in the future. 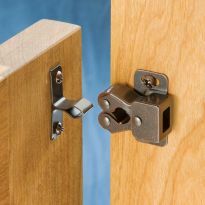 Rockler glider brackets are well engineered and very exact. I used them on a design I made for a glider bench. Modified some plans I found for an outside chair by reducing stock sizes, creating a fanback back rest, and sunray burst side panels to allow more air to flow through. The last modification was a platform and glider hardware to convert the chair to glider. Used a coat of Cetol 1 Cedar and (2) coats of Cetol Dek Finish Cedar in hopes of less strenous maintenance in the future. 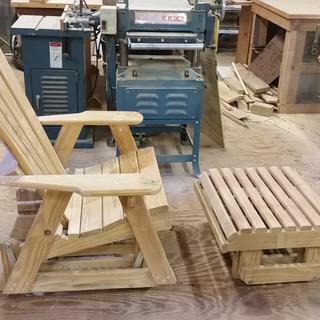 Dad got his chair early and it looks like I'll be making more of them! 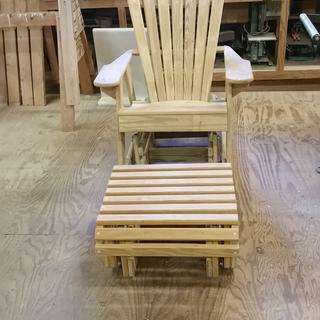 i purchased 2 sets earlier and made 2 chairs.they work very smoothly so i want to make 2 more with more of a reclining position. Plans require this particular glider brackets. Was given Rockler and the part number in the plans I have. All wood is cut and time to assemble then glide off into the sunset. I read the reviews and I know the name Rockler. It works great for what is was designed for. Compact too unlike the others I've seen. The bracket currently on my outdoor glider snapped apart. These were the same brand & I liked the reviews I read about your company. 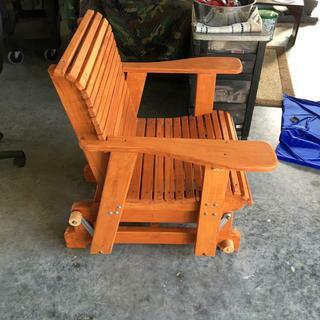 my son made this glider a few years back for a 4-H project he didn't realize he needed a certain size and they would be hard to find and bought a set of brackets of an amish couple and they never fit right and they kept bending and we finally found the magazine to order the right brackets. We love using this magazine to build things and we will continue to use it and we will now help and make sure he reads all directions and order the right parts a head of time and will get them from here. previous parts ordered have proven to be quality parts. I build gliders and these are the most reliable and well constructed. A bit expensive but compared to the rest on the market the price appears reasonable. It was recommended from Wood Magazine Glider plans. Couldn't find them anywhere else and your install instructions are not correct. Have used these glider brackets on two other benches and have found them to work very well. I am building a glidder chair. Fixing on old wooden glider for our lanai. I live in Guatemala and purchased a wonderful chair there that would be even better with a bit of movement. The idea of converting it to a glider came along and you guys provided the hardware that I'll need for my little project. 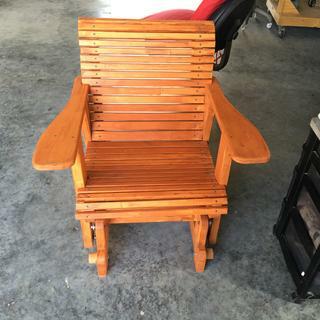 My wicker chair is in good shape and I cannot find these brackets locally. I need longer gliders for a loveseat on a stand. 12" from center to center of mount. Any idea where I could find these? 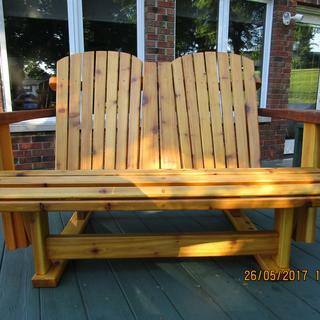 BEST ANSWER: Just converted a bench for my wife to a glider the legs of the bench where I mounted the glider was from front leg to rear leg 22.5 inch and the base the part that does not move under the bench was 25 inches so tops are further apart then the bottoms. I was using recovered gliders from and old glider stool they were 6.5 inches center of bearings long. installed glider hardware, the swing will glide only a couple of inches forward and/or backwards? Is this all they glide or have installed wrong? BEST ANSWER: Mine did the same thing. The brackets were correct.. There is a front and back design to the base of the glider, which I had installed wrong...flipped them around front to back and it works like brand new. Depending on what angle they are mounted, if they are mounted where they hang almost straight down, you should get 6 to 10 inches of swing. looking for glider bearing arm for jack post glider tete-a-tete where would I find it? BEST ANSWER: Rockler carries the standard glider bearings. Best way to start, would be look in the Y.P. under bearings in your area. Some carry the, "Freeway" product line. Check with "Motion Industries", "Kaman Industrial", "Applied Industrial" or an independent in your area. One of them should be able to help you. I am replacing worn-out hardware on a 30-year-old bench with the Rockler brackets here. Since these are different than my original hardware, I had to modify the bench to accomodate the longer brackets. 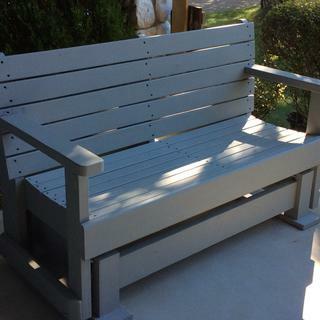 My question - Should both brackets hang perfectly vertical to the points where they attach to the bench? The old hardware was connected so than the front bracket connected at about 7 o'clock and the rear bracket was at 6. This caused the bench to tip forward slightly when it swung forward. On the other hand, the 6/7 method provided a finite stopping point to the glider's swing. Since I don't have the original plans, I don't know the logic for connecting these brackets - 6/6 o'clock or some other...? 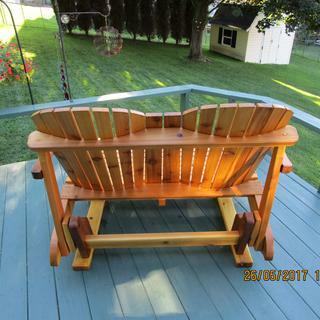 Can these glider brackets be used to convert a porch swing to a glider? 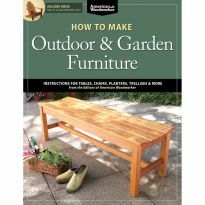 BEST ANSWER: I used them on a glider I built from scratch but the set was basically a porch swing attached to a stand. If you can make a stand it would be possible. As I recall, the instructions were pretty specific about dimensions and clearances so it shouldn't be to hard to figure out. Hope this helps. If your porch swing is flat and the base the swing is attached to is also flat. The swing movement with these brackets is about 6 inches. Scott, I believe that they could be used for that, However in my opinion they need to be longer to provide a smooth operation. Yes. But you will have build the base for it. Will these work on a wide chair? BEST ANSWER: should work great. 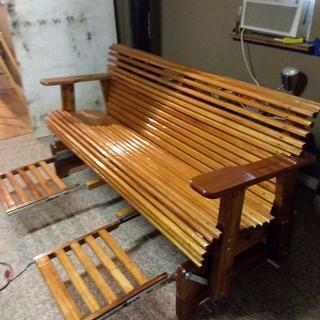 I used them on a cedar glider loveseat and they work very well. Built over a year ago and still operating without any problems. 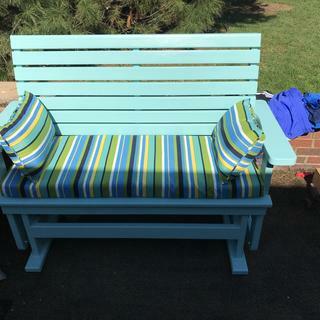 I built a loveseat for our front porch with mine. 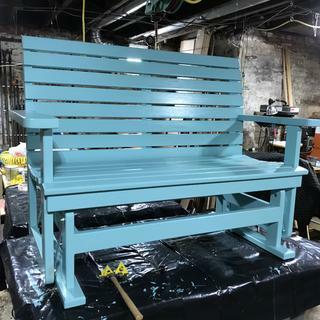 About 50" wide, seats two. These pivot brackets work very well. For sure! I use them on a very wide bench. Don't see why they wouldn't work on a wide chair. Yes I have used them on a 5' gliding bench that I make. BEST ANSWER: Don't know what the actual wt limit is. These do appear to be very stury and shold easily support 300 - 350 lbs. however no one has the ability to tell how they should be configured as far as spacinf between the front and back gliders. If you put them in the position as directed in the instructions the glider will only have a short choppy swing. Not the comfortable "glide" you would expect. And no one at rockler can give you an answer or seem to be willing to find an answer to this. Just like selling an item but not being able to give specs such as weight support. I used the gliders on a love seat. The two people that use it are just over 500 lbs. I believe the gliders are ok, it would be the wood and placement of holes that would be in question. So far there is no problem for that amount of weight. I have old glider that glides on base with springs. Does any one have a parts breakdown on the foot? I am not completely sure of what you are asking. The package is just exactly as the page pictures, four length of steel with a bearing on each end. BTW If you off set the bottom back from center line you will get a bit of a rocking motion in the swing. The glider hardware has no springs. These arms have quite a bit of play in them, are they supposed to be countersunk and installed with washers to limit the play? BEST ANSWER: Not necssary to counter sink. Just use the install instructions to be sure you have the correct clearance between the part that will be in motion and the support item. In my case, the moving part is a glider supported on each side by a base which stands on the floor. The weight of the glider helps stabilize the arms. I did not countersink , but I did use washers to get the correct spacing that is specified. 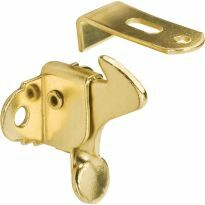 Looking for Glider Bracket Hardware for baby cradle. Hoping this will work?? I used them for an outdoor swing and they worked fine so they should be all right for your cradle. Good luck. how much weight does the glider hardware support? BEST ANSWER: I used them I’m not very heavy outdoor rocker that holds two people. 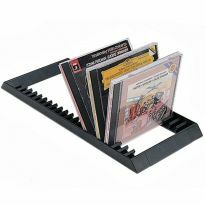 It is made of pressure treated wood either to buy for or one by four lumber and must weigh about 70lb. It easily holes a couple wearing a total love 450 lbs. I am not exactly sure how much weight it will hold but I built a bench out of oak 4 1/2 feet long I’ve had four people sitting on it and it glides beautifully Enter an answer to this question. I need these gliders with the hole 10.5" on center any suggestions? BEST ANSWER: specific If you need these brackets, then you have only one choice, buy them,have a welding shop cut them and weld in a piece to get your needed length. As it is, the distance between centers is advertised as 7.5"
You can make a set out of wood, using something like the ones on Ebay (I would have given the link but Rockler blocked it ) and making the arms the length you need. I'm not sure why you need a certain spacing on these if you are using them for a glider i just mount them where they fit, On the side of my gliders they install like this \ / not totally vertical. hope this helps. 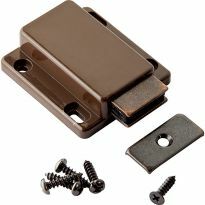 the plans I bought say I can buy the glider bracket for $19.99 when I shop for them they are $31.99 item #58330 what is up? What is the total distance of travel of the seat from when it is fully forward to when it is fully back? It doesn't seem to have enough swing. Seems like the brackets need to be longer. BEST ANSWER: If you want more swing you need to angle the brackets. if you install them vertically it limits the swing. I have mine at a 45 degree angle front and back and I get a lot of movement. Does that make it hang funny when not in use? Thank you for the help. Can I get glider arms in stainless? BEST ANSWER: I have been using these brackets on lots of gliders over the years and never seen them in stainless. the ones from Rockler hold up fine. 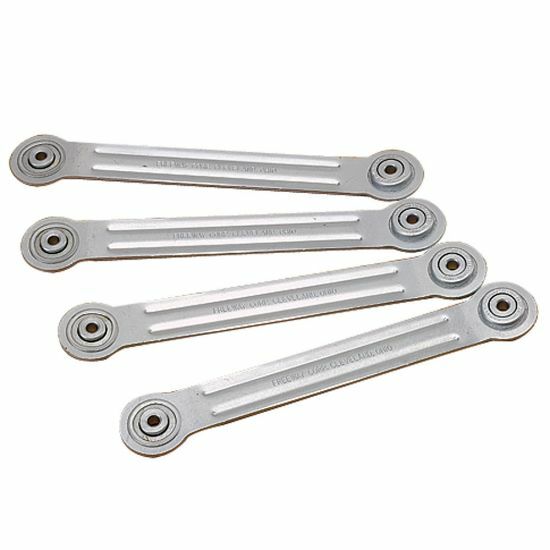 do glider arms come in stainless? BEST ANSWER: It would be nice if they did, but I'm afraid not. what is the control number and where do I find it? BEST ANSWER: Exactly what are you referring to ? where can i buy the rubber grommets that go between the arm rest bracket and the seat support? BEST ANSWER: I Didn't use rubber grommets, I bolted directly to wood. Worked fine.